The Standard & Poors 500 Index added 0.4 percent to 1,981.04 at 10:13 a.m. in New York. The Standard & Poor’s 500 Index added 0.4 percent to 1,981.04 at 10:13 a.m. in New York. (Bloomberg) — U.S. stocks advanced as companies from Apple Inc. to Time Warner Inc. and Intel Corp. rallied amid deals and earnings reports while data showed China’s second- quarter economic growth topped estimates. Time Warner surged 17 percent as Rupert Murdoch’s 21st Century Fox Inc. made a takeover bid that was rebuffed. Intel gained 5.9 percent as its third-quarter sales forecast fueled optimism the personal-computer market is emerging from a two- year slump. Apple and International Business Machines Corp. rose at least 1.1 percent after agreeing to develop applications for corporate users of wireless devices. The Standard & Poor’s 500 Index added 0.4 percent to 1,981.04 at 10:13 a.m. in New York. 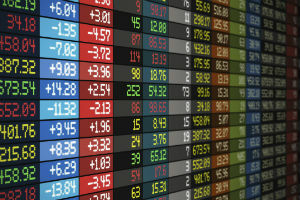 The Dow Jones Industrial Average increased 55.39 points, or 0.3 percent, to 17,116.07. Trading in S&P 500 companies was 56 percent above the 30-day average for this time of day. Fourteen companies in the S&P 500 including EBay Inc. and Yum! Brands Inc. are reporting second-quarter results today. Profit by the gauge’s members increased 4.5 percent in the quarter, and revenue rose 3.1 percent, according to estimates compiled by Bloomberg. Intel climbed 5.9 percent, the most in the Dow. The PC market has shown signs of improvement this year as corporate spending picked up and U.S. shipments returned to growth. Intel’s outlook indicates demand is starting to recover among consumers, who may be buying laptops and desktops again after years of opting for smartphones and tablets instead. Intel also added $20 billion to its stock-repurchase program, including $4 billion planned for the third quarter. Time Warner surged 17 percent to $83.42. 21st Century Fox made an $80 billion takeover bid in recent weeks for Time Warner that was rebuffed, the New York Times reported, citing people briefed on the matter whom it didn’t identify. Fox indicated that it would sell CNN to ward off potential antitrust concerns since Fox News competes directly with CNN, the newspaper said. Fox confirmed the proposal. The company is prepared to offer more than $85 a share for Time Warner Inc., according to a person with knowledge of the matter. Fox shares fell 2 percent. Apple rose 1.1 percent and IBM gained 1.5 percent to $191.99. The deal enables the iPhone maker to expand beyond individual customers and add more corporate clients through IBM’s sales force. IBM gets a boost in its effort to sell software and services to companies seeking to manage workers’ wireless devices. International Game Technology jumped 8.1 percent. Rome- based Gtech SpA agreed to buy the world’s biggest slot-machine maker for $4.7 billion. Bank of America Corp. dropped 2.2 percent. The second- biggest U.S. bank said profit declined 43 percent as it spent $4 billion to cover litigation costs, including a mortgage settlement with American International Group Inc.
Yahoo! Inc. fell 4.1 percent. The U.S. Web portal reported second-quarter earnings and sales that fell short of analysts’ estimates. The S&P 500 has rallied 7.2 percent this year amid better- than-estimated corporate earnings and central bank stimulus. The U.S. economy is showing signs of recovering from a 2.9 percent contraction in the first quarter. Data today showed China’s economic growth accelerated for the first time in three quarters. Gross domestic product rose 7.5 percent in the April-June period from a year earlier, beating the 7.4 percent median estimate in a Bloomberg News survey of economists. U.S. industrial production climbed 0.2 percent in June, capping the strongest quarter in almost four years and indicating manufacturers are providing a bigger spark for the U.S. economy. The gain in output at factories, mines and utilities followed a revised 0.5 percent advance in May, figures from the Fed showed today. A separate report indicated that wholesale prices in the U.S. rose more than forecast in June, reflecting a jump in energy costs that is now abating. Fed Chair Janet Yellen said yesterday in testimony to the Senate Banking Committee that the central bank must press on with monetary stimulus as “significant slack” remains in labor markets and inflation is still below the Fed’s goal. Three rounds of Fed bond-buying have helped propel the S&P 500 higher by more than 190 percent during the current five-year bull market. The S&P 500 fell 0.2 percent yesterday and the Russell 2000 Index lost 1 percent after the Fed said valuations for smaller social-media and biotechnology companies are substantially stretched. Small-caps and Internet shares were the biggest victims of a market retreat earlier this year as investors dumped the best performers of the bull market amid concern valuations advanced too far. Seven of 10 main industries in the S&P 500 advanced today. Technology companies jumped 1 percent as a group. The Dow Jones Internet Composite Index increased 0.1 percent after slumping 0.7 percent yesterday. TripAdvisor Inc., Netflix Inc. and Amazon.com Inc. rebounded more than 0.9 percent. –With assistance from Anna Hirtenstein in London.